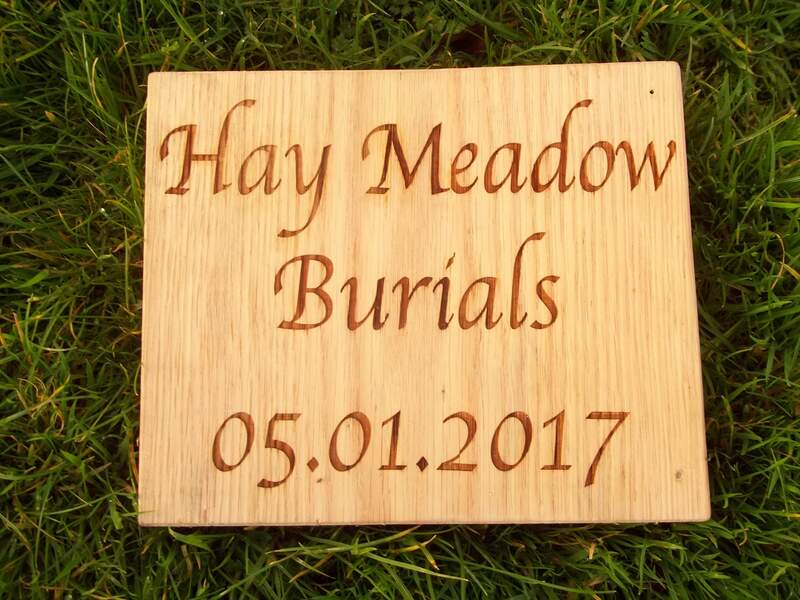 Hay Meadow Burial Ground is to remain a traditional hay meadow giving great care and consideration to the wildlife that share it. We are also in the adjoining meadow creating a grazed woodland where further wildlife will freely roam. 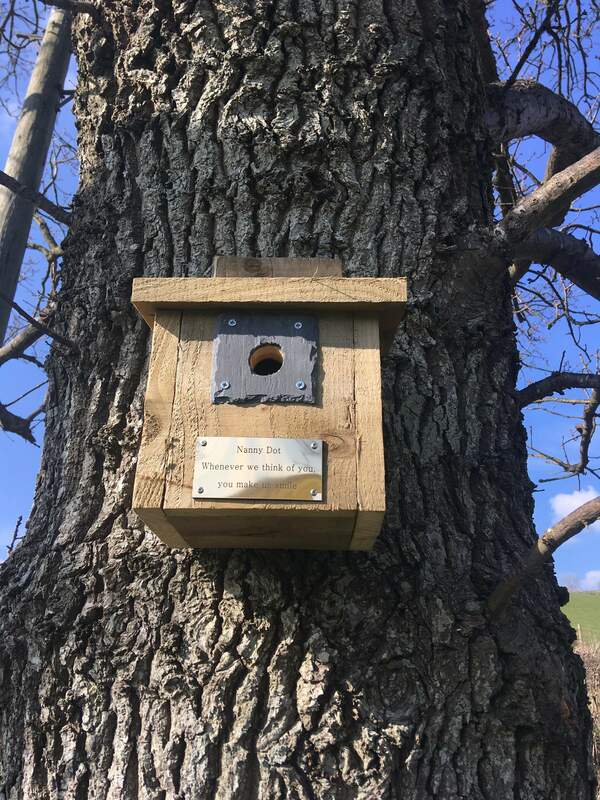 We feel strongly that all memorials need to be in keeping with the surroundings and not cause any harm to the wild life but most importantly try to help them flourish. Here are the memorials which we have available, with others still being thought about!! For graves, an oak plaque inscribed with names and dates,can be placed on graves, flush with the ground. We place it on a bed of local gravel to help it last longer, but it will naturally return to the earth in time not intending to be a permanent memorial. These will be able to be placed 6 months after burial – sooner for ashes burial. already planted establish and the new woodland matures we will have more availability. so a variety of birds can be nesting in the burial ground. Plaques can then be mounted on these boxes with the names, dates and chosen words. 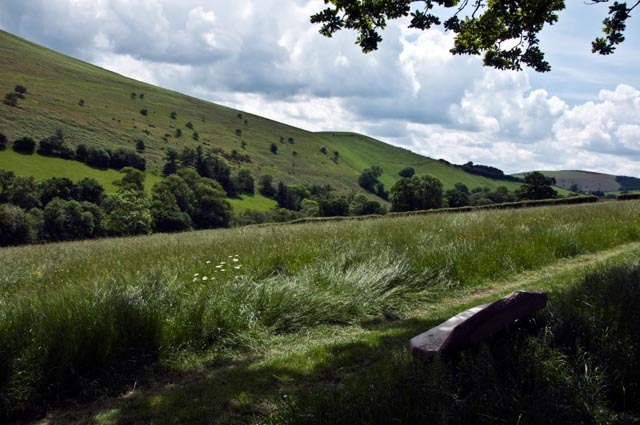 Only a very limited number of handmade wooden benches can be purchased as we don’t want the meadow and future woodland to become park-like but to give those who visit a comfy spot to sit, look up at the hills and reflect. Names, dates and chosen simple words can be engraved. Bees are now finding it hard to survive and we seriously need them!! So, in memory of your loved one, who may well have kept bees, loved gardening or simple been a lover of pure honey, let their memory thrive and sponsor our bees. We spoil our bees as they have their own apiary in the adjoining orchard, a prime spot next to the meadow where they are working hard to establish the wild flowers. Donation of £200 which includes a memorial plaque which will be placed on a working hive. Richard and Sarah, the proprietors.